A cold front arrived in Dallas today and brrr, is it cold! Time for some homemade chili! Brittany first made this chili a few weeks ago when I visited her in Michigan. It was great to have since the sun barely came out and the temperature stayed in the 30s. Brit eats healthy, so she substituted lean ground turkey for the ground sausage. 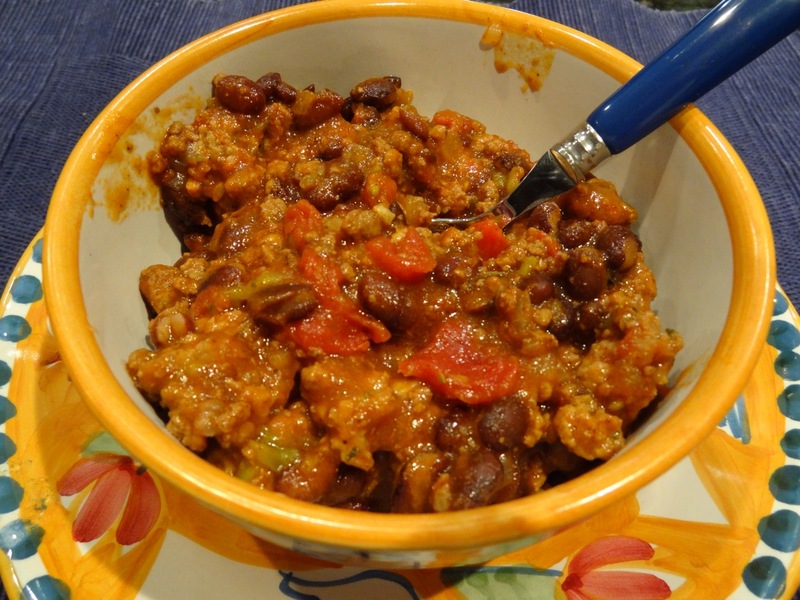 My mom made this same chili recipe last week, except she decided to keep the sausage. While the chili is good either way, the sausage adds a nice spicy flavor and tunes the dish up quite a bit. I loved it! Finally, the chili tastes better the second day you eat it. On the first day, my dad said the chili had too much of a tomato taste to it. Like I said, the flavors blend better the second day. Enjoy and stay warm! 2. In a dutch oven over medium heat, warm oil. Saute beef, sausage, onion and garlic until meat is no longer pink and onion is tender, about 10 minutes. Add remaining ingredients and mix well. 3. Cover and bake 1 hour, stirring occasionally. Uncover and bake 30 minutes longer. Remove bay leaf and discard. 4. Serve, topped with sour cream, sliced green onions or grated cheddar cheese. 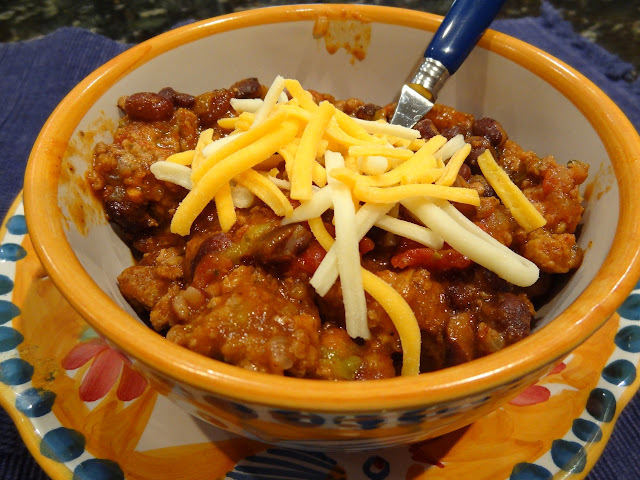 5 Responses to "Thick Oven-Baked Chili"
So glad you enjoyed the chili. I’ll have to try making it a day ahead so the flavors are better. Thanks for linking to the recipe. Perfect day for chili, high of 35 degrees today. This is now my husbands and my favorite chili. Made it as written and it had the perfect amount of spiciness. So glad you enjoyed it!! It definitely was cold this weekend…may be a work from home day this week!